The Chief Executive Officer of Nestle Central and West Africa Region, Kais MARZOUKI chaired a stakeholder convening in Accra, Ghana on the 25th November, 2016 with approximately 35 participants attending. 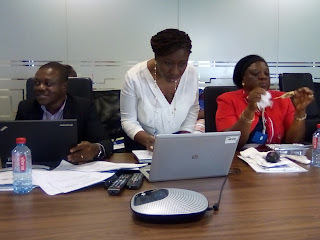 The participants were from Gabon, Senegal, Cote D’Ivoire, Nigeria, Cameroon, Burkina Faso, Benin and Ghana. The multi-national company brought together top level personalities from nutrition societies, nutrition and food safety, paediatrics association, dietetic associations, ministry of food and agriculture, lecturers of university, food and drug authority, GAIN (Global Alliance for Improved Nutrition), Ministry of Education, Laboratory Analysts, Ministry of Trade, GIZ, Royal Netherland Embassy, FAO, Ministry of Economy and Investment Sustainability, OXFAM and Civil Society Organisations. Kais MARZOUKI told participants that his company has been aiming at creating shared value at all levels to improve on wellbeing of populations in the Central and West Africa region countries of their implantation. He added that their company operates on a policy guided and driven by purpose and shared values which enhance the quality of life of people and thereby contributing to a healthier future for all. For over 150 years, the company has been providing quality and safe nutrition through its over 2000 brands in 189 countries around the world. It has 436 companies implanted in85 countries. The regional head office in Accra, Ghana has existed since 1957. The recent meeting in Accra, Ghana was the second Stakeholders Convening in Central and West Africa. The head office is located in the vicinity of the Kotoka International Airport area and the working language is English. Nestle believes that for a company to be successful over the long term and create value for shareholders, it must create value for society. At company, this means creating superior, long-term value for shareholders by offering products and services that help people improve their nutrition, health and wellness. To achieve this, Creating Shared Value (CSV) is the approach it is taking to the business as a whole. Besides nutrition, it is focusing on water and rural development, given their critical importance not only to business but also to the employees, farmers, suppliers, distributors and communities where they operate. CSV encourages business to create economic and social value simultaneously by focusing on the social issues that iy is uniquely capable of addressing. It builds on a strong base of performance in environmental sustainability and compliance, and recognizes the vital role of engaging and collaborating with other organisations. 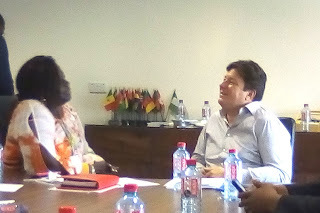 In order to engage further in Creating Shared Value in the Central and West African region, Nestle decided to hold a second regional stakeholder convening in Accra, Ghana after the first held in Bonaberi=Douala, Cameroon. The purpose of this convening was to:  Discuss and obtain feedback on its CWAR’s Creating Shared Value initiatives (progress made since previous convening)  Understand stakeholder perceptions of CWAR’s performance on specific issues  Stimulate fresh thinking / ideas on issues  Understand opportunity and risk, both present and future, for particular issues  Prioritise key actions on issues to take them into account in the company’s strategy. Invited stakeholders had expertise aligning with topics covered in Creating Shared Value strategy noted above, and an understanding of regional and/or local business environment. These stakeholders include, but were not limited to:  Government organisations  Non-governmental organisations  International or multilateral organisations  Academics and  Industry associations It was hoped that participants saw the convening as an opportunity to engage constructively with Nestlé CWAR, and discuss key challenges, future direction and expectations while also identifying areas for developing and executing collaborative solutions. After accepting to participate in this stakeholder convening, participants were asked to complete a number of tasks prior to, during and after the event. Prior to the convening, external participants were asked to: o Read some background material relating to the business and Creating Shared Value o Fill out a short online form to inform the convening’s content and logistics During the convening, participants were asked to: o Provide constructive yet candid feedback o Educate and openly challenge Nestlé o Identify opportunities for improvement and potential collaboration After the convening, participants were asked to: • Provide any amendments to the meeting minutes for completeness and accuracy Expectations of the CWAR Convening by the participants were as follows: • Respond to any questions from stakeholders about content and logistics prior to the convening During the session, Nestlé was expected to: • Listen to and learn from feedback from stakeholders • Respond to concerns and recommendations After the session, the company was expected to: • Share the main summary and the minutes of the meeting with stakeholders • Maintain open channels of communication with stakeholders Key discussion points, conclusions and outcomes were noted and circulated confidentially to all participants. Because Chatham House Rules1 were used during the convening, any content from the session were not attributed to the speakers. This report on the convening is expected to be used to inform further on Creating Shared Value strategy and communications. Themes handled by experts included:  Nutrition education and meeting the SDG’s  Developing rural communities (women empowerment / water & sanitation/ youth employment)  Agriculture The Central and West Africa region is considered to have the fastest growing population expected to reach 441 Million by 2020. There is increased internet communication connectivity. Due to the fact that Nestle operates in a complex environment, cannot tackle issues alone, wants to be part of the solution it considers effective dialogue and collaboration as key for collaborative initiatives between private and public sectors, civil society, multilaterals and academia. Overall comments on 2014 feedback shows that in the area of Industrialization and investment strategy, there was increased use of locally sourced raw materials, support of landlocked countries and creation of more jobs opportunities. More effort in nutrition education and information tackled perception issues (salt, BMS) and help to build HCP knowledge in nutrition. In order to make progress, it all starts with listening to stakeholders, who make Constructive feedback, educate and challenge the company, give fresh and innovative thinking solutions through Identification of opportunities for improvement. During the shared value convening, Nestle listens and learns from the feedback before responding to r concerns and recommendations. It is expected to integrate key learning strategies into future action plans after identifying possible areas of collaboration.